There are no maps, pitures, or graphs on the html version. A Task Force to look at the potential for risks posed by Near Earth Objects has been announced by Science Minister, Lord Sainsbury. The three-strong team will make proposals to the British National Space Centre on the nature of the hazard and the potential levels of risk. It will also consider how the United Kingdom should best contribute to international effort on NEOs. Lord Sainsbury said the Task Force will be chaired by Dr Harry Atkinson, formerly of the Science and Engineering Research Council (SERC) and past Chairman of the European Space Agency's Council. Two other appointees, Sir Crispin Tickell and Professor David Williams join Dr Atkinson. The Minister said: "The risk of an asteroid or comet causing substantial damage is extremely remote. This is not something that people should lie awake at night worrying about. But we cannot ignore the risk, however remote, and a case can be made for monitoring the situation on an international basis. "I hope that the setting up of this Task Force will help the UK to play a full and prominent role in international discussions on this important issue. I am delighted to be able to announce such a well-qualified team of experts and I look forward to receiving their report by the middle of 2000." Near Earth Objects are either asteroids or comets. Many NEOs have been identified and their orbits determined using ground-based telescopes, including some of NASA's, in a number of countries, although many remain to be surveyed. Of the known NEOs, none is believed to pose a significant risk to the Earth in the foreseeable future. However, on a time scale of many millions of years, the Earth has been hit by objects of sufficient size to cause serious damage, including the object which is thought to have impacted the Earth about 65 million years ago, with global consequences including the extinction of the dinosaurs. The British National Space Centre has responsibility for co-ordination with the work of other agencies on the threat to the Earth from space debris and NEOs. Dr Harry Atkinson, a New Zealander by birth, has had many years of experience in dealing with science and technology internationally. This has involved both intergovernmental organisations (such as the ESA) and the co-ordination of activities between national agencies (including NASA). He was attached to the Cabinet Office in the early 1970s, on the staff of the Chief Scientific Advisor, where his tasks included reviewing all governmental activities in environmental pollution. Subsequently, in the Science Research Council his responsibilities included astronomy and space. This involved UK co-operation with other countries in many space science missions, and in ground-based astronomical facilities in Australia, South Africa, Hawaii and La Palma. He helped to set up the European Synchrotron Radiation Facility at Grenoble and the EISCAT facility in the Arctic Circle; and was concerned with the High-Flux Beam Reactor (ILL), also at Grenoble. Until a year ago, he was Chief Scientist of the British insurance industry's Loss Prevention Council. Sir Crispin Tickell has been Chancellor of the University of Kent since 1996 and has a distinguished diplomatic career. He was Permanent Secretary of the Overseas Development Agency, 1984-87, British Permanent Representative to UN, 1987-90, and Warden of Green College, Oxford, 1990-97. Sir Crispin has played a prominent role in presiding, chairing and advising committees and associations on environmental issues. These include Chairmanship of the International Institute for Environment and Development; the Climate Institute of Washington; Earth Watch (Europe) and the Advisory Committee on the Darwin Initiative for the Survival of Species since 1992. He is author of a wide range of environmental publications. Professor David Williams holds the Perren Chair of Astronomy at University College London and is President of the Royal Astronomical Society. He was previously Reader in Mathematics and Professor of Theoretical Astrophysics at the University of Manchester Institute of Science and Technology, UMIST, and has worked at NASA's Goddard Space Flight Center. He is co-author of titles on interstellar chemistry and astrophysics, and has published over 200 articles in learned journals. Lord Sainsbury, the Minister with responsibility for space, today published the report of the Near Earth Objects Task Force set up in January this year, to look at the potential risk posed by collision of the Earth with Near Earth Objects. "The Task Force, under the able chairmanship of Dr Harry Atkinson, has done an excellent job in getting to grips with this complex issue, and in putting together views on how we should proceed. I welcome the Task Force's approach, which includes proposals for collaboration with international partners. Over the next couple of months I will be considering the Government's response to the Task Force's recommendations in consultation with colleagues". c. advise HMG on what further action to take in the light of a. and b. above and on the communication of issues to the public. 2. The Task Force was chaired by Dr Harry Atkinson, formerly of the Science and Engineering Research Council (SERC) and past Chairman of the European Space Agency's Council. Sir Crispin Tickell, British diplomat, and Professor David Williams, immediate past President of the Royal Astronomical Society, completed the team. 3. Near Earth Objects are asteroids and comets whose orbits bring them close to the Earth. 4. The Task Force met on a number of occasions and presented its report to the Director General of BNSC on 16 August 2000. The British National Space Centre (BNSC) provided the secretariat for the Task Force. SOLAR SYSTEM showing the Sun, the planets, the main belt of asteroids and the orbit of a typical comet (drawing not to scale). The planets are, counting from the Sun: Mercury, Venus, Earth, Mars (to the left), the giant planet Jupiter (to the right) and Saturn (top left, back cover). The comet, coming from the far reaches of the Solar System, is shown in two positions along its orbit. The comet's tail always points directly away from the Sun. The belt of asteroids contains about one million objects over 1kilometre in size. Some asteroids are deflected by Jupiter's gravitational field to become Near Earth Objects. A stony asteroid is shown at the bottom of the cover; it is covered with small craters by the impact of other asteroids over the ages. Moon impact craters (bottom) and Earth (top) photographed from US Clementine spacecraft 1994. Asteroid and comet impact craters on far side of Moon. On 4 January 2000 the Minister for Science, Lord Sainsbury, announced the setting up of a Task Force on Potentially Hazardous Near Earth Objects (NEOs). 3. advise the Government on what further action to take in the light of 1 and 2 above and on the communication of issues to the public; and to report to the Director General of the British National Space Centre (BNSC) by the middle of 2000. The Task Force was chaired by Dr Harry Atkinson with Sir Crispin Tickell and Professor David Williams as members. The British National Space Centre provided the Secretary, Richard Tremayne-Smith, and general support. The Task Force met on a number of occasions and presented its Report to the Director General of the British National Space Centre in August 2000. The Task Force has been supported by the British National Space Centre; and has been helped greatly by many people in the United Kingdom, in Europe, the United States and in other countries. We cannot hope to name them all. Alan Fitzsimmons, Tom Gehrels, Alan Harris, Nigel Holloway, Brian Marsden, Tony Mayer, David Morrison, Paul Murdin, Martin Rees, Hans Richter, Jay Tate, Richard West, Iwan Williams, Pete Worden, Don Yeomans; and a special thanks to Duncan Steel for suggesting many of the illustrations and in other ways. In addition, the following have much helped us: Michael A'Hearn, Morris Aizenman, David Asher, Ben Atkinson, Jim Beletic, Andrea Boattini, Roger Bonnet, Giacomo Cavallo, Catherine Cesarsky, Moustafa Chahine, Andrew Cheng, Paul Chodas, Victor Clube, Marcello Coradini, Ian Corbett, David Crichton, Len Culhane, David Dale, Vernon J Ehlers, Jim Emerson, Walter Flury, Bob Fosbury, Simon French, Iain Gilmour, Monica Grady, Robert Hawley, Eleanor Helin, Jeremy Hodge, Ken Hodgkins, John Houghton, David Hughes, Julian Hunt, Raymond Hyde, Syuzo Isobe, Lindley Johnson, Adrian Jones, Patrick Laycock, Jean Le Guen, Robert MacMillan, Vittorio Manno, Neil McBride, Craig McKay, Duncan Moore, Patrick Moore, Tom Morgan, Ian Morison, Richard Oberman, Ron Oxburgh, Lembit Öpik, Vernon Pankokin, Carl Pilcher, Klaus Pinkau, John Ponsonby, Steven Pravdo, David Price, Antonio Rodotà, Michael Schultz, John Schumacher, Geoff Sommers, Hugh Van Horn, Victor Vilhard, Dan Weedman, Chandra Wickramasinghe, John Zarnecki. Enormous numbers of asteroids and comets orbit the Sun. Only a tiny fraction of them follow paths that bring them near the Earth. These Near Earth Objects range in size from pebbles to mountains, and travel at high speeds. Such objects have collided with the Earth since its formation, and brought the carbon and water which made life possible. They have also caused widespread changes in the Earth's surface, and occasional extinctions of such living organisms as the dinosaurs. The threat has only recently been recognised and accepted. This has come about through advances in telescope technology allowing the study of these usually faint objects, the identification of craters on the moon, other planets and the Earth as a result of impacts, and the dramatic collision of pieces of the comet Shoemaker-Levy 9 with Jupiter in 1994. Impacts represent a significant risk to human and other forms of life. Means now exist to mitigate the consequences of such impacts for the human species. The largest uncertainty in risk analysis arises from our incomplete knowledge of asteroids whose orbits bring them near to the Earth. With greater information about them, fairly accurate predictions can be made. The risk from comets is between 10 and 30 per cent of that from asteroids. The advance warning period for a potential impact from a long period comet may be as short as a year compared to decades or centuries for asteroids. Short period comets can be considered along with asteroids. The threat from Near Earth Objects raises major issues, among them the inadequacy of current knowledge, confirmation of hazard after initial observation, disaster management (if the worst came to the worst), methods of mitigation including deflection, and reliable communication with the public. The Task Force believes that steps should be taken at government level to set in place appropriate bodies international, European including national where these issues can be discussed and decisions taken. The United Kingdom is well placed to make a significant contribution to what should be a global effort. The recommendations of the Task Force are given with supporting arguments in Chapter 9. We recommend that the Government should seek partners, preferably in Europe, to build in the southern hemisphere an advanced new 3 metre-class survey telescope for surveying substantially smaller objects than those now systematically observed by other telescopes. The telescope should be dedicated to work on Near Earth Objects and be located on an appropriate site. We recommend that arrangements be made for observational data obtained for other purposes by wide-field facilities, such as the new British VISTA telescope, to be searched for Near Earth Object Objects on a nightly basis. We recommend that the Government draw the attention of the European Space Agency to the particular role that GAIA, one of its future missions, could play in surveying the sky for Near Earth Objects. The potential in GAIA, and in other space missions such as NASA's SIRTF and the European Space Agency's BepiColombo, for Near Earth Object research should be considered as a factor in defining the missions and in scheduling their completion. We recommend that the 1 metre Johannes Kapteyn Telescope on La Palma, in which the United Kingdom is a partner, be dedicated to follow-up observations of Near Earth Objects. We recommend that negotiations take place with the partners with whom the United Kingdom shares suitable telescopes to establish an arrangement for small amounts of time to be provided under appropriate financial terms for spectroscopic follow-up of Near Earth Objects. We recommend that the Government explore, with like-minded countries, the case for mounting a number of coordinated space rendezvous missions based on relatively inexpensive microsatellites, each to visit a different type of Near Earth Object to establish its detailed characteristics. We recommend that the Government together with other governments, the International Astronomical Union and other interested parties seek ways of putting the governance and funding of the Minor Planet Center on a robust international footing, including the Center's links to executive agencies if a potential threat were found. We recommend that the Government should help promote multi-disciplinary studies of the consequences of impacts from Near Earth Objects on the Earth in British and European institutions concerned, including the Research Councils, universities and the European Science Foundation. We recommend that the Government, with other governments, set in hand studies to look into the practical possibilities of mitigating the results of impact and deflecting incoming objects. We recommend that the Government urgently seek with other governments and international bodies (in particular the International Astronomical Union) to establish a forum for open discussion of the scientific aspects of Near Earth Objects, and a forum for international action. Preferably these should be brought together in an international body. It might have some analogy with the Intergovernmental Panel on Climate Change, thereby covering science, impacts, and mitigation. We recommend that the Government discuss with like-minded European governments how Europe could best contribute to international efforts to cope with Near Earth Objects, coordinate activities in Europe, and work towards becoming a partner with the United States, with complementary roles in specific areas. We recommend that the European Space Agency and the European Southern Observatory, with the European Union and the European Science Foundation, work out a strategy for this purpose in time for discussion at the ministerial meeting of the European Space Agency in 2001. We recommend that the Government appoint a single department to take the lead for coordination and conduct of policy on Near Earth Objects, supported by the necessary inter-departmental machinery. We recommend that a British Centre for Near Earth Objects be set up whose mission would be to promote and coordinate work on the subject in Britain; to provide an advisory service to the Government, other relevant authorities, the public and the media, and to facilitate British involvement in international activities. In doing so it would call on the Research Councils involved, in particular the Particle Physics and Astronomy Research Council and the Natural Environment Research Council, and on universities, observatories and other bodies concerned in Britain. We recommend that one of the most important functions of a British Centre for Near Earth Objects be to provide a public service which would give balanced information in clear, direct and comprehensible language as need might arise. Such a service must respond to very different audiences: on the one hand Parliament, the general public and the media; and on the other the academic, scientific and environmental communities. In all of this, full use should be made of the Internet. As a first step, the Task Force recommends that a feasibility study be established to determine the functions, terms of reference and funding for such a Centre. T he Earth has been under a constant barrage of objects from space since its formation four and a half billion years ago. They cover a wide range, from the very small to the very big, with greatly different rates of arrival. Every day hundreds of tonnes of dust enter the upper atmosphere; every year objects of a few metres diameter do likewise, and some have effects on the ground; every century or so there are bigger impacts; and over long periods, stretching from hundreds of thousands to millions of years, objects with a diameter of several kilometres hit the Earth with consequences for life as a whole. For long there was an unwillingness to recognise that the Earth was not a closed system on its own in space. The vast increase in knowledge over the last half century has shown otherwise. For example, it is now widely accepted that the impact in Yucatan caused the global changes associated with the end of the long dominance of the dinosaur family, some 65 million years ago. The huge Barringer crater in Arizona, created some 49,000 years ago, was attributed to volcanic action. Even the destruction of thousands of square kilometres of forest in Siberia in 1908 was somehow brushed aside. An equivalent impact on a city would eliminate it within a diameter of about 40 kilometres, say the diameter of London's ring road, the M25. Although over two-thirds of the Earth is covered by water, and much of the remainder is desert, mountain or ice-cap, traces of many previous impacts can now be found. This bombardment is integral to life on Earth. The Earth was formed of the same material. Without carbon and water there could be no life as we know it. Periodic impacts have revised the conditions of evolution, and shaped the course of the Earth's history. As a species humans would not now exist without them. On one hand we can rejoice in them; on the other we can fear for our future. 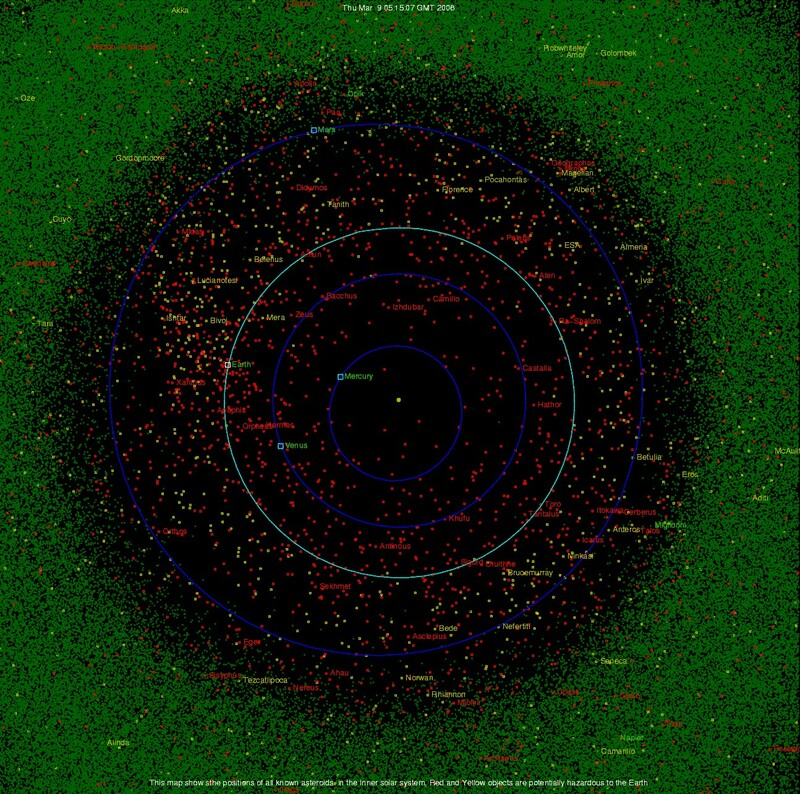 ORBITS OF ALL NEAR-EARTH ASTEROIDS known at beginning of the year 2000, about 800 in all. The orbits of the asteroids which cross the Earth's orbit (Apollo-and Aten-types) are coloured yellow. They are potentially dangerous. The others, the "Amors", coloured red, approach the Earth but cannot strike our planet. Also shown are the orbits of Mars, Earth, Venus and Mercury, with the Sun at the centre. The illustration shows that the Earth is hemmed in by a sea of asteroids. The risk of impacts is discussed in Chapter 4. Understanding of the threat from Near Earth Objects asteroids, long-and short-period comets is relatively new (see Chronology at Annex A). With gathering evidence of past impacts, and a possible analogy with the effects of nuclear war, the general public as well as the astronomical and military communities began to take a somewhat anxious interest. The spectacle of the comet Shoemaker-Levy 9 colliding with the planet Jupiter in July 1994, throwing up fire-balls as big as the Earth, and such films as Armageddon and Deep Impact added to the concern. Most practical work on the subject has so far been done in the United States. The US Congress and the US Administration through NASA and the Department of Defense have promoted studies and surveys, including the survey being done through a NASA programme at the Lincoln Laboratory of the Massachusetts Institute of Technology. Pioneering work has been done at the Minor Planet Center at Boston. At international level there has been interest in the United Nations, particularly at successive UN Conferences on the Exploration and Peaceful Uses of Outer Space. The Council of Europe in Strasbourg, the European Space Agency and many other bodies have drawn attention to the hazards. The same goes for the International Astronomical Union, which brings together astronomers from all over the world, and the Spaceguard Foundation set up in Rome in 1996 with some national centres, including Britain. These and other bodies organised an important conference in Turin in June 1999, when a scale for measuring the effects of impacts was established. In Britain there has been interest in both Houses of Parliament, and a debate took place in the House of Commons on 3 March 1999.This was followed by the creation of the present Task Force by the Minister for Science in January 2000. In the Report which follows, the Task Force examines the nature of the asteroids and comets which circulate within the Solar System. We look at the facilities required to identify the orbits and composition of those coming near the Earth which range, in the words of a distinguished American astronomer, "from fluff ball ex-comets to rubble piles, solid rocks and slabs of solid iron", each with different consequences in the event of terrestrial impact. We look at the effects of such impacts, according to size and location. They include blast, firestorms, intense acid rain, damage to the ozone layer, injection of dust into the atmosphere, tsunamis or giant ocean waves, and possible vulcanism and earthquakes. We then assess the risks and hazards of future impacts. Building on the work already done, we consider how a worldwide effort might be best organised and coordinated, and what the British contribution might be, both in national and international terms. Here an element of particular importance is public communication, which should be neither alarmist nor complacent. Finally we look into the fundamental problem of action in the event of an emergency. Should we do as has been done in the past, and simply let nature take its course? Should we plan for civil defence, trying, for example, to cope not only with direct hits but with such side effects as tsunamis? Should we help promote technologies which might destroy or deflect a Near Earth Object on track for the Earth? If so what methods should be used, and what would be the implications? These and other issues are immensely difficult, and the Task Force does not have all the answers. But it is convinced that at a time when we understand better than ever before the consequences for the world as a whole, an international effort of research, coordination and anticipatory measures is required in which British science, technology and enterprise should play an important part. BARRINGER (OR METEOR) CRATER, Arizona, of diameter 1.2 kilometres was created about 49,000 years ago by a small nickel-iron asteroid. The crater's origin was for long controversial; eventually fragments of the asteroid were identified together with the impact shock structure in the impacted rocks and ejected material just outside the rim. Asteroids are sometimes called minor planets. Like the Earth and all the planets, asteroids move in orbits around the Sun, and so do comets. Asteroids and comets are remnants of the formation of the Solar System about 4.5 billion years ago. Asteroids were the building blocks of the inner planets; both they and comets delivered to Earth life's building blocks, carbon and water. Asteroids and comets can range in size from pebbles or lumps of ice, to rocky or icy worlds nearly 1,000 kilometres across. There are countless numbers of asteroids and comets in the Solar System in well-defined regions far from the Earth. The gravitational forces of the large planets, mostly the huge planet Jupiter (which comprises about 90 per cent of the combined mass of all the planets), and collisions with other asteroids or comets, slowly alter the orbits of these small bodies. Following many deflections, an asteroid or comet may occasionally become a Near Earth Object, when its orbit intersects that of the Earth or is within 0.3 Astronomical Units (astronomers call the Earth to Sun distance one "Astronomical Unit" or 1 AU). It may even crash onto the Earth. An object is said to be potentially hazardous when its orbit comes even closer to Earth, to within 0.05 AU (7.5 million kilometres or about 20 times the Earth to Moon distance) and when it is at least 150 metres in diameter. So far, 258 potentially hazardous objects have been discovered, a number that increases all the time as the surveys continue. Given enough accurate measurements of the position of an asteroid or comet, astronomers can predict their paths over centuries. But as they move about the Solar System, they continue to suffer small deflections so that their orbits are not wholly predictable far into the future. Comets can sometimes be seen easily by the naked eye when they are near the Sun, by their bright tails. Asteroids are dark and generally smaller, and are invisible to the naked eye; this is why not even the biggest, Ceres (933 kilometres across), was discovered until 1801. Astronomers are finding that the distinction between comets and asteroids is becoming increasingly blurred; but it is still convenient to speak of them separately as we do below. Most asteroids are in orbits between those of Mars and Jupiter, two to four times further from the Sun than is the Earth (or 2 to 4 AU). This main belt of asteroids contains about 1 million objects over 1 kilo-metre in diameter. Unlike stars, asteroids emit no visible light. We can only see them by the Sun's reflected light using a powerful telescope; this is because each asteroid is very small and its surface so dark that it reflects only a small amount of light. ASTEROID EROS: Eros, shaped like a potato, is about 33 kilometres long, 13 kilometres wide and 13 kilometres thick. The crater at the top is 5.3 kilometres in diameter. Most known near Earth asteroids are less than 1 kilometre across, much smaller than Eros. This picture is a mosaic of six photographs taken in February 2000 by NASA's NEAR spacecraft then orbiting Eros at 200 kilometres above its surface. The numerous impact craters show that even asteroids are hit by other asteroids many times in their histories. NEAR/ NASA small percentage of the light falling on it. Usually we see an asteroid only as a point source so that its size cannot be directly determined. It is therefore difficult to calculate the destructive power of an asteroid if it were to impact on the Earth. We discuss this problem further in Chapter 5. Asteroids are made of carbonaceous (carbon containing) materials, rocks (silicates) or metal. They may comprise piles of boulders held together only by their own very weak gravitational attraction, or be solid lumps of stone or slabs of iron. They are not spherical and may spin or tumble as they go. Stony asteroids can have a density substantially less than that of the material of which they are made, indicating that they may sometimes be porous or loosely packed. There are many sub-categories of asteroids: each behaves differently when entering the Earth's atmosphere, and in its reaction to countermeasures. Comets Many comets are in the Edgeworth-Kuiper Belt, a region beyond Neptune, between 30 to 1,000 times further from the Sun than the Earth. Perturbations of comets at the inner edge of the Belt by giant planets cause them to evolve out of the Belt giving rise to so called short-period comets, with periods of less than 200 years and orbits close to the plane in which the planets move. At the time of the formation of the giant planets, much of the small icy debris from which they were forming was ejected from the Solar System by the powerful gravitational forces of the growing planets. Some of these small bodies were almost but not quite ejected and remain in very long orbits, forming the so-called Oort cloud. The cloud comprises billions of comets in a spherical shell around the outer reaches of the Solar System, about 40 to 50 thousand times further away from the Sun than the Earth or about one light-year, a quarter of the way to our nearest star. The Oort cloud is the source of long-period comets with return times greater than 200 years. The regions from which comets come are so cold that they still contain frozen gases including water vapour, methane, ammonia, carbon dioxide and hydrogen cyanide. Comets are essentially "dirty snow-balls" and include many particles of dust. It is only when a comet comes near the Sun that these gases evaporate, freeing the dust that forms the tail sometimes seen by the naked eye. ASTEROID BELT INSIDE JUPITER'S ORBIT. The belt comprises about 1 million asteroids of diameter 1 kilometre and above; some asteroids are occasionally deflected into orbits near the Earth's orbit. Comets from much further out in the Solar System are denoted by unward - pointing wedges. Only objects from JPL's DASTCOM database are used. ORBITS OF ATEN, APOLLO AND AMOR, which gave their names to the three main classes of near Earth asteroid. The Aten and Apollo classes cross the Earth's orbit; the Atens spend most of their time between the Earth and Sun, making it difficult to observe them with ground-based telescopes. Amors are always outside the Earth's orbit and are therefore not potentially dangerous. With a telescope, it is possible to observe the tails of many comets even at a distance of 5 AU from the Sun. However, some comets have lost their volatile gases and no longer generate tails; these dead comets look much like asteroids and can only be seen when near the Earth. Short-period comets are likely to have been seen before and their orbits can be accurately measured; possible impacts can thus be predicted well in advance. Long-period comets have not been near the Earth during the brief age of science, so their orbits cannot have been determined and are therefore impossible to predict. Such comets may arrive from almost any direction. These factors make long-period comets particularly dangerous the more so if they are dead and therefore difficult to observe. Even with very large special survey telescopes we could have less than a year's warning of a possible impact . A comet can be many times more damaging than an asteroid of the same mass. This is because comets on average have an impact speed about twice that of an asteroid, and their energy or destructive power goes as the square of their velocity. Numbers Estimates of the numbers of Near Earth Objects of different sizes can be made either by direct measurement using ground-based telescopes or by observing the numbers and sizes of craters on the Moon or on the planet Mercury. SOURCES OF COMETS: the source of long-period comets is the Oort Cloud, a spherical shell of billions of comets around the outer edge of the Solar System; occasionally a comet is deflected from the cloud to an orbit coming close to the Sun and Earth (shown). Because the shell is spherical, the comet can arrive near the Earth from any direction. Short-period comets come from the Edgeworth-Kuiper belt beyond the planet Neptune, much closer to the Sun; these comets generally lie in the plane of the planets. Diagram not to scale. ORBITS OF HALLEY'S COMET AND HALE-BOPP: the former, a short period comet, returns every 76 years. Hale-Bopp is a long-period comet first seen by telescopes in 1995; the plane of its orbit is at an angle to the plane containing the planets. Both comets are unusually large: the former is about 10 kilometres long and the latter 40 kilometres. 0rbit of a typical comet shows the results of bringing together both these methods of estimation, for asteroids only. Comets would increase the numbers by only a few per cent. There are roughly 1,000 near Earth asteroids of diameter greater than 1 kilometre, and about 100,000 with diameters greater than 100 metres. However, the numbers are very uncertain: for asteroids above 1 kilometre the correct number could be anywhere in the range 500 to 1,500, while for 100-metre asteroids the range is even wider 30,000 to 300,000.These uncertainties underlie the need for more and better observations. The atmosphere protects the surface of the Earth from most Near Earth Objects, which burn up or explode at high altitudes. Whether they impact on the surface depends on a number of factors: their size, their composition, their velocity, and the angle of their approach. Unlike some bodies in the Solar System, the Earth carries relatively few scars from past impacts. In the short term, erosion by wind and weather and, in the long term, tectonic plate movement, remove the traces. Only recently have we been able to detect some of the major impact craters, ranging from Chicxulub in Mexico with a diameter of 180 kilometres (caused by the explosion which marked the end of the dinosaurs), to Ries in Germany with a diameter of 25 kilometres; and to assess the magnitude of the environmental effects which must have been caused. We also have immediate experience of minor events. For example the explosion of an object of around 5 metres diameter at 20 kilometres altitude over the Yukon on 18 January 2000 caused a loud bang, a flash of light, a shower of fragments, and an electromagnetic pulse which caused a temporary loss of power transmission over the area. Further examples of impacts are given at Annex B. The main effects of impacts are blast waves, tsunamis (or ocean waves), injection of material into the atmosphere, and electromagnetic changes near the surface. We now look briefly at each. Depending on its size, a particular Near Earth Object can have one or more of these effects. The table overleaf summarises the range of effects for objects of different diameter; and the graph on page 17 shows their average frequency of impact. Blast waves An asteroid colliding with the Earth is travelling at a speed between 15 and 30 kilometres per second when it arrives at the top of the Earth's atmosphere. A comet is much faster, up to about 75 kilometres per second. For comparison Concorde travels at about 0.6 kilometres per second. The asteroid or comet generates powerful shock waves as it enters the atmosphere, which lead to enormous heating of both the Earth's atmosphere and the object, which might be destroyed or vaporised. IMPACT ON JUPITER OF COMET SHOEMAKER-LEVY 9, on 21 July 1994. Before impact the comet broke into a number of fragments hitting the planet as shown by the belt of bright spots near the bottom of the picture. The impacts created fireballs each as big as the Earth. The very bright spot at the top right is the Jovian moon Io. Photograph taken at infrared wavelengths by Infrared Telescope Facility on Mauna Kea, Hawaii. <10 Upper atmosphere detonation of "stones" (stony asteroids) and comets; only "irons" (iron asteroids) <3%, penetrate to surface. 75m 10 to 100 1.5 1,000 Irons make craters (Barringer Crater); Stones produce air-bursts (Tunguska). Land impacts could destroy area the size of a city (Washington, London, Moscow). 160m 100 to 3 4,000 Irons and stones produce ground-bursts; comets 1,000 produce air-bursts. Ocean impacts produce significant tsunamis. Land impacts destroy area the size of large urban area (New York, Tokyo). 350m 1,000 6 16,000 Impacts on land produce craters; ocean-wide to tsunamis are produced by ocean impacts. Land 10,000 impacts destroy area the size of a small state (Delaware, Estonia). 700m 10,000 12 63,000 Tsunamis reach hemispheric scales, exceed to damage from land impacts. Land impacts destroy 100,000 area the size of a moderate state (Virginia, Taiwan). 1.7km 100,000 30 250,000 Both land and ocean impacts raise enough dust to to affect climate, freeze crops. Ocean impacts generate 1 million global scale tsunamis. Global destruction of ozone. Land impacts destroy area the size of a large state (California, France, Japan). A 30 kilometre crater penetrates through all but the deepest ocean depths. 3km 1 million 60 1 million Both land and ocean impacts raise dust, change to climate. Impact ejecta are global, triggering wide-10 million spread fires. Land impacts destroy area size of a large nation (Mexico, India). 7km 10 million 125 10 million Prolonged climate effects, global conflagration, to probable mass extinction. Direct destruction 100 million approaches continental scale (Australia, Europe, USA). 16km 100 million 250 100 million Large mass extinction (for example K/ T or to Cretaceous-Tertiary geological boundary). 1 billion >1 billion Threatens survival of all advanced life forms. * 1 MT = explosive power of 1 megatonne of TNT. The Hiroshima atomic bomb was about 15 kilotonnes; and the hydrogen device on the Bikini atoll about 10 MT. After D Morrison et al, p 71, Hazards (T Gehrels, Ed) 1994, including data from Alan Harris in the graph on page 17. The area affected by winds of much greater than hurricane force can be calculated for air bursts, and it has been found that as for nuclear weapon explosions the area of devastation for a given energy of explosion varies according to altitude. The air burst caused by the impact of an object of around 50 metres in diameter at Tunguska in Siberia in 1908 flattened some 2,000 square kilometres of forest. Had it struck an urban area, there would have been an enormous death toll. Obviously the size of the area affected by an air burst depends on the composition and mass of the asteroid and on its path to the Earth. The 1.2 kilometre diameter Barringer crater in Arizona was created by a similar-sized iron asteroid. For relatively small surface impact events, blast wave damage is comparable to that caused by air bursts. However, as the size of the object and therefore the energy of the impact increases, the explosion becomes so vast that some of the atmosphere above the impact site is blown away from the Earth. In this way the coupling of the energy into the blast wave is reduced. As a result blast waves from large objects, like the one that caused the Chicxulub event, are not expected to devastate directly more than a few per cent of the Earth's surface, but the area of devastation on the ground would be the size of a large country. The immediate consequence of the blast wave associated with these large events is local not global scale damage. Nonetheless it could cause many deaths and great material damage. It could also have other consequences which could enhance the death toll many times. For these really large objects, the ejection of material into the atmosphere described below has a far greater effect in global terms. Tsunamis Some two-thirds of the Earth's surface is covered by the oceans so that the chances of an impact are greater there than on land. As in the case of impact on land, a "crater" is produced in the water but such craters are unstable and rapidly refill. A 30 kilometre crater penetrates through all but the deepest ocean depths. These flows create a series of deep water waves, so-called tsunamis, which propagate outwards from the point of impact. Such waves are also set in motion by earthquakes and underwater land slips. They can travel far around the Earth with devastating effects. ASTEROID AND COMET IMPACT CRATERS on far side of Moon, taken in 1969 by NASA's Apollo 11 mission. The large crater (top centre) is about 80 kilometres across. The Moon has no atmosphere to protect it and is constantly bombarded by asteroids and comets. AVERAGE INTERVAL IN YEARS BETWEEN IMPACTS on the Earth of near Earth asteroids of different diameters. The underlying data are as for the graph on page 13, and have the same wide range of uncertainties. If comets were included, impacts of a given destructive level would be more frequent by between 10 and 30 per cent. For a 1 kilometre asteroid the interval is about 200 thousand years; and for a 100 metre one, about 3 thousand years. Based on an unpublished diagram from Alan Harris of NASA/ JPL including data from Rabinowitz et al (2000). Chile caused a tsunami in Japan, some 17,000 kilometres away, that killed at least 114 people. The maximum height above sea level in Hawaii for the same event was 15 metres, with 61 deaths. Tsunamis travel as fast as aircraft, and their destructive effects can be enormous. The destruction is caused by the amplification in the height of the waves as the waves approach the shoreline. The inflow and outflow of the water mentioned above causes huge damage to property as well as risk to life. The evidence of the effects of large tsunamis, in terms of relocated rocks, is found widely, the most extreme example being in Hawaii where unconsolidated coral is found at 326 metres above sea level. Asteroid impacts are capable of producing tsunamis much larger than that associated with the 1960 earthquake, and may occur anywhere in the oceans. Tsunami from the Chicxulub impact deposited material widely and often far inland; recognition of such deposits in Haiti, Texas and Florida helped to confirm the nature and location of the event. The tsunami generated by the Eltanin impact about 2 million years ago is shown on the two maps on this page. Objects that are small, or small fragments of larger objects that break up in the atmosphere, do not usually reach the Earth's surface. But for objects in the range of between 200 to 1,000 metres, tsunamis may be the most devastating of all the consequences of an impact, because so much of the Earth's population lives near coasts. Some studies have indicated that an impact anywhere in the Atlantic of an object 400 metres in diameter would seriously affect coasts on both sides of the ocean by tsunamis as much as 10 metres or more in height at the shore line. Injection of material into the atmosphere The clay layer marking the huge Chicxulub event contains large numbers of particles which were melted at the time. They are the size of small ELTANIN IMPACT of a large asteroid into the south east corner of the Pacific about 2.15 million years ago. The evidence of the impact comes from the ocean floor which shows damage over hundreds of square kilometres. The two maps shown are based on calculations. The map above shows the wave front after 5 hours; it is about 70 metres high and has travelled over 2,000 kilometres. Inset on the map is a cross section of the crater formed at impact: it is 60 kilometres wide and 5 kilometres deep. The map to the left shows that the resulting tsunami would have spread over the whole Pacific Ocean, reaching Japan in about 20 hours, and into the Atlantic affecting the coast of southern Africa. Raindrops. Such drops remain in the atmosphere only for a day or two, and are not therefore important for reducing sunlight. But the energy they radiate as they cool would be capable of igniting fires from any combustible material. Such fires would generate soot and poison the air with pyrotoxins. Smaller particles would stay aloft longer, possibly for months -or, for very big impacts, years -and the large number of such particles could cause reduction of sunlight. But if large quantities of water from the oceans were also injected into the atmosphere, then the formation of ice crystals on the particles could help to sweep the dust from the skies. A cooling effect at the surface of the Earth -the so called nuclear winter effect -would be caused in the event of a large number of such particles, and that would correspond to a very large explosion, say of an object around 1 kilometre in diameter. The effects on the Earth of such a winter could be devastating for all forms of life, including humans. Other chemical changes would also follow impacts. Temperatures behind shock waves are such that nitrogen burns in the oxygen to create nitrogen oxides of various kinds. These oxides are a source of acid rain, and also remove ozone from the atmosphere. The effective screen to solar ultra-violet radiation would therefore be weakened. It would take time for the ozone layer to recover. Electromagnetic effects in the upper atmosphere Disturbances in the ionosphere from the atmospheric detonation of a nuclear weapon have been detected at distances as large as 3,000 kilometres from the explosion. Although this explosion was at a low altitude, shock waves occurred at altitudes as great as between 100 and 200 kilometres. Because impacts of Near Earth Objects are of much higher energy than explosions of nuclear weapons, the electromagnetic effects will be correspondingly greater, leading to large scale heating and high intensity electromagnetic disturbances. Even from the frequent air bursts that occur from the impacts of small objects (around 10 times per year), modest disturbances in radio communications are frequently noted and power line failures occur. More severe electromagnetic effects may disrupt other electrical installations. CLEARWATER LAKES, Quebec, Canada: the beds of the twin lakes of diameters 22 and 32 kilometres were formed simultaneously by the impact of a pair of asteroids about 290 million years ago. The larger of the two shows a prominent ring of islands formed from the central uplifted area and covered with impact melts. Our understanding of the risk to the Earth of impacts from Near Earth Objects depends in part on which of two situations obtains. For objects whose orbits we know accurately in advance, we can predict with some accuracy (for many years to come) the time and place of any potential impact on the Earth. For these objects, the future is thus largely determined, with little statistical uncertainty. However, for objects yet to be discovered (for which the orbits are by definition unknown) we must rely on a statistical approach. Here, all we can do is to estimate the average frequency of impact for objects of different size, as described in Chapter 2; for none of these can the precise time or place of impact be anticipated. Clearly, the objective should be to move as many potentially hazardous Near Earth Objects as possible from the second category to the first: to move from a situation of statistical chance to one of certainty, in which we should be able to plan ahead. Our recommendations for an advanced observational programme, to which we give the highest scientific priority, are framed accordingly. The present position is as follows. From measurements over recent years, made largely by groups in the United States, we know the orbits of over 400 Near Earth Objects of diameter above 1 kilometre. These measurements allow us to state with some confidence that none of these is likely to hit the Earth over the next 50 years (see Annex B-3). However, it is estimated that a similar number of objects of this size have yet to be discovered. For smaller objects -which can also cause great destruction locally or regionally -we know even less. For example, we have discovered fewer than 10 per cent of objects of diameter 300 metres, and a much smaller proportion of 100 metre objects. ESTIMATED FATALITIES for a wide variety of different impact scenarios (after Chapman & Morrison, 1994, Nature 367, 33) coming years the orbits of all objects down to diameters of 300 metres, by the use of larger telescopes than those currently employed. These observations would also improve our statistical knowledge of the diminishing population of objects as yet undiscovered. Through this programme, and through studying, as we recommend, the consequences of impacts and of the possibilities for mitigation, we should be able to make more accurate forecasts. This would also provide a firm foundation on which to increase general understanding of the problem and to communicate intelligently with the public in the event of a real emergency. The consequences of an impact in terms of human life are estimated in the table on page 20 for different kinds of impact, assuming no attempt at mitigation. The results are inevitably speculative, and depend on a wide range of factors including the composition of the object; this range is reflected in the spread of the numbers. For sub-global events, the number of fatalities expected in an individual impact is highly variable. Once the global threshold has been exceeded, the consequences for each event are expected to be more uniform. The material damage produced by an impact and the consequences of that damage have been less well studied. Impacts from very large Near Earth Objects with diameters over 10 kilometres would have global consequences that could cause the extinction of most living organisms. Such events are fortunately very rare. Impacts of objects from a few kilometres in diameter to 10 kilometres are also rare. Impacts from objects with diameters of around 1 kilometre can also have global consequences. On average these are the most dangerous because they are much more frequent than the objects of the 10 kilometre class and give many more casualties per impact than the smaller ones. Impacts of smaller objects, with diameters of a few hundred metres, would have dramatic local consequences, but are unlikely to affect the Earth as a whole. For objects below about 50 metres in size the Earth's atmosphere usually provides good protection. Impacts from mid-sized Near Earth Objects are thus examples of an important class of events of low probability and high consequence. There are well- established criteria for assessing whether such risks are to be considered tolerable, even though they may be expected to occur only on time-scales of thousands, tens of thousands or even hundreds of thousands of years. These criteria have been developed from experience by organisations like the British Health and Safety Executive to show when action should be taken to reduce the risks. Flood protection, the safety of nuclear power stations, the storage of dangerous chemicals or of nuclear waste are all examples of situations in which rare failures may have major consequences for life or the environment. Once the risk is assessed, plans can be made to reduce it from the intolerable to the lowest reasonably practical levels taking account of the costs involved. If a quarter of the world's population were at risk from the impact of an object of 1 kilometre diameter, then according to current safety standards in use in the United Kingdom, the risk of such casualty levels, even if occurring on average once every 100,000 years, would significantly exceed a tolerable level. If such risks were the responsibility of an operator of an industrial plant or other activity, then that operator would be required to take steps to reduce the risk to levels that were deemed tolerable. For an island country, the risks from tsunami effects are significant because of the large target area of the surrounding ocean. The western coast of Europe, including the United Kingdom, is at risk from an impact in the Atlantic Ocean or North Sea, as also are New Zealand or Japan from impacts in the Pacific Ocean. Destruction to property could of course be on a massive scale, and might not be avoidable, and the consequent social and political consequences could be severe. The level of the risk to life and property from Near Earth Objects is largely related to what we choose to do in the future. If we do nothing, the consequences would be as described here. But by discovering and tracking most of the dangerous objects (at the same time improving our statistical knowledge of the remainder), and by studying further the consequences of impacts and the possibilities for mitigation, we can hope to exert some control over future events. In this chapter we outline the astronomical techniques needed to discover most Near Earth Objects above a given size. We then briefly describe the observations necessary to determine the orbit and physical characteristics of any detected object. Most of the measurements can be made with ground-based telescopes and radars, rather than with expensive space-based missions. While some dedicated facilities are essential, much valuable work can be done by occasional or serendipitous use of telescopes or spacecraft with different prime scientific aims. In the past amateur astronomers around the world have contributed to the study of Near Earth Objects and this should continue. But for almost all activities dedicated professional work is essential. Discovery/ survey Because we cannot predict where new objects may come from, we must observe the whole sky, frequently and systematically. This calls for specially designed wide-angle telescopes with advanced detector arrays coupled to very fast computers. They should operate automatically and remotely, and be dedicated to observations of Near Earth Objects. An example of such a facility is the US LINEAR system with two 1m telescopes, observing objects of diameter above about 1 kilometre. For complete coverage, survey telescopes are required on good sites in each hemisphere. Bigger dedicated telescopes would allow surveys of smaller objects: a 3 metre instrument would cover objects down to a few hundred metres in diameter. In addition, larger ground-based telescopes primarily intended for extra-galactic surveys, such as the new British 4 metre VISTA instrument and the 6.5 metre survey telescope proposed in the United States, would inevitably detect many Near Earth Objects. Such large instruments could also help to discover long-period comets. Some classes of objects are difficult, or perhaps impossible, to discover from the ground, for example asteroids with orbits inside that of the Earth's (Inner Earth Asteroids). The European Space Agency has recently studied a space-telescope mission primarily to survey objects of this type. Missions including space telescopes, such as the Agency's GAIA proposal and NASA's SIRTF, could be used to discover such objects. Follow-up observations to determine the orbit of a Near Earth Object To determine the orbit of an object after its initial discovery, conventional narrow-angle ground-based telescopes are needed in each hemisphere. Because a newly discovered object rapidly becomes fainter as it moves away from the Earth, follow-up observations must be made within days of discovery. While some telescopes should be dedicated to this function, follow-up observations can be made with pre-arranged and rapid access to suitable telescopes used for other purposes. For very accurate and rapid orbit determinations of a known object which is near the Earth, radar is an exceptionally useful technique. OBSERVATION OF NEAR EARTH OBJECT: an asteroid or comet near the Earth can be discovered because it moves against the "fixed" background of stars. This is shown in the above three images taken of the same area of the sky at 30-minute intervals. The asteroid, 1997 XF11 is arrowed. It is indistinguishable from the stars except for its movement. NEO Taskforce Report mass. The mass of a Near Earth Object is surprisingly difficult to measure using ground-based telescopes. It depends first on knowing the brightness of the object and the proportion of the Sun's light which it reflects (called its albedo), from which its size may be deduced. But we also need to know its density to determine its mass: the density is deduced from its chemical composition (icy, carbonaceous, stony or metallic) using spectroscopic observations at visible and infra-red wavelengths. Because of the uncertainties in knowing the albedo (which can vary by a factor of five or more), the size and therefore the mass of an observed object can be very greatly in error. It is also subject to uncertainty in the density. NASA's recent rendezvous mission, NEAR, has shown that the asteroid Mathilde has a density substantially smaller (perhaps by a factor of three) than expected from its chemical composition; this asteroid must be porous or consist of a loose aggregation of rocks. Such uncertainties make it hard to predict whether a particular asteroid might cause a global or a regional catastrophe. To do better we can use ground based radar which as well as measuring the position and velocity can also determine the size, shape, gross structure and spin of an object when it is sufficiently near the Earth, but not its mass. There is no suitable radar facility in the southern hemisphere. But for more accurate measurements of mass, composition and gross structure, space rendezvous missions are needed. In this way the mass of an object can be determined by measuring the pull of its gravitational field on the spacecraft; its shape measured photographically; and its chemical composition found using mass spectrometers. Approximately 20 sub-groups of asteroids and comets are thought to exist. A rendezvous mission to a member of each of these would enable direct information to be determined and linked to corresponding ground-based spectroscopic observations of an unvisited object. Relatively inexpensive microsatellites could fulfil this purpose. So far, no mission has yet been able to determine an object's internal composition or whether it is hollow. Such an observation will be attempted on a comet by NASA's Deep Impact mission to be launched in 2004. This chapter describes current work on Near Earth Objects around the world and the organisations involved, government and otherwise (except in the United Kingdom, covered in Chapter 7). United States The United States is doing far more about Near Earth Objects than the rest of the world put together. An essential element is the support of the US Congress. The central programme, to discover 90 per cent of objects above 1 kilometre in diameter in 10 years, is progressing well. The Minor Planet Center is at the hub of observations worldwide. In addition, military surveillance facilities in space and on the ground look continuously for objects and explosions in the upper atmosphere, including those from Near Earth Objects. The United States recognises that observations of Near Earth Objects bring good science as well as relating to a practical problem. Earth Asteroid Tracking programme (NEAT). The same group is fitting new CCD detectors to the classic 1.2 metre Schmidt telescope at Mt Palomar (California). The Spacewatch team at the University of Arizona has a different approach: it uses a 90 centimetre telescope, but looks for smaller objects over a limited area of sky. A 1.8 metre telescope is being completed to extend this work. Near Earth Objects are also observed at the Lowell Observatory and through the Catalina Sky Survey, both based in Arizona. Work to characterise their properties has been carried out by a number of groups using optical telescopes, including one operated by MIT. Particularly important for characterisation and imaging is the use of powerful radar using the giant radio telescope controlled by Cornell University at Arecibo, Puerto Rico, with another at Goldstone in California controlled by the Jet Propulsion Laboratory. NASA's space programme on smaller Solar System objects, costing about $100 million a year, comprises a number of rendezvous missions to asteroids and comets (listed at Annex D). The objectives are partly pure science, but the missions contribute much to the understanding of Near Earth Objects, which would be important if countermeasures were contemplated. The Agency supports most academic planetary science in the United States. At present the NEAR mission is in orbit above the surface of the asteroid Eros, photographing its surface. In 2005 the Deep Impact mission will project a half-tonne block of copper on to Comet Tempel 1. Much should be learnt about the internal structure of the comet by observing the resulting crater and the material ejected from it. NEO Taskforce Report other objectives, are also able to observe Near Earth Objects. These include the Hubble Space Telescope, the Next Generation Space Telescope and the Space Infra-Red Telescope Facility (SIRTF). In addition ground-and space-based surveillance observations by the US Air Force regularly pick up explosions from small asteroids in the upper atmosphere. During the visit of the Task Force to the United States in March, NASA emphasised the need for work by other countries to complement their activities, mentioning three particular points; follow-up observations of objects which are often discovered but then lost; the search for smaller Near Earth Objects; and, in the southern hemisphere, the lack of dedicated optical telescopes and planetary radar. NASA emphasised the value of plates taken over many years by the United Kingdom Schmidt Telescope in Australia. For the future, the US National Science Foundation told us of the proposal for a 6.5 metre wide-angle survey telescope, which would be of outstanding value for surveying small Near Earth Objects, although its prime purpose would be extra-galactic work. Organisation of United States activities The US Congress has named NASA to be responsible in the United States for Near Earth Objects, assisted by the United States Air Force. Within NASA, the Headquarters is responsible for soliciting and selecting all science investigations, ground-based and space-based, for the detection and scientific exploration of Near Earth Objects; for guidance on strategic planning and mission selection; and for coordination with other agencies and organisations including international ones. In addition, a specially created Program Office has been set up at NASA's Jet Propulsion Laboratory to co-ordinate ground-based observations to complete the survey of objects of 1 kilometre and upwards; to facilitate communications within the observing community and between the community and the public regarding potentially hazardous objects; to respond to public inquiries; to maintain a publicly accessible catalogue of Near Earth Objects; to develop a strategy for their scientific exploration including in situ investigation by space missions, and to help Headquarters in its role regarding other US agencies and foreign activities. Essential to the coordination and archiving of observations, and the setting of targets for follow-up, is the Minor Planet Center based at the Smithsonian Institute at Harvard. The Minor Planet Center is broadly under the wing of the International Astronomical Union and is funded in part by NASA on an annual basis. In addition we note that the National Science Foundation is responsible for funding basic science including astronomy in universities except for work in planetary science. Some work on Near Earth Objects is nonetheless being done on National Science Foundation funded telescopes. The Department of Defense does not have planetary defence as part of its remit. But in its normal defence role in detecting incoming missiles, it observes many Near Earth Objects from both its ground-and space-based platforms. There is no coordinated approach to Near Earth Objects in Europe. The Spaceguard Foundation continues to promote interest and helped organise a major international conference on the subject in Turin in 1999.The Foundation is based in Italy, and is closely linked to the Istituto di Astrofisica Spaziale in Rome, supported by the Italian Research Council. The Institute is building a small survey telescope in Italy, and at Pisa there is a group expert in planetary dynamics and Near Earth Object orbit calculations. There are also related activities in universities and institutes including some in France, Germany, Sweden, Finland, Greece and former Soviet Union countries. Interest in the subject is developing in a number of European institutions, including the Council of Europe. The European Union and its Commission have no formal policy on Near Earth Objects at present. The European Space Agency has a direct and developing interest. In 2003 it plans to launch its Rosetta mission to rendezvous with a comet and fly past two asteroids, following its successful Giotto mission to Halley's comet. It is also considering plans to launch the GAIA space telescope mission in about 10 years' time. In 1999 the Agency's Long Term Policy Committee recommended that the Agency should be involved in studying the threat from Near Earth Objects and possible countermeasures. In addition the Agency is developing a statement of its possible future role in this respect for consideration at a Ministerial meeting on future strategy in 2001.This meeting will also involve the European Union. Recently, the Agency's operations centre in Germany conducted several studies on Near Earth Objects with the Spaceguard Foundation of Italy. The first was for a Spaceguard Central Node, a data-centre for follow-up observations to complement the Minor Planet Center. A further study was completed early this year for a Spaceguard Integrated System for Potentially Hazardous Object Survey, including the study of a space telescope for observing objects in inner Earth orbits, and each object's composition. The European Southern Observatory has no formal involvement in work on Near Earth Objects at present. It has a number of large telescopes and advanced detectors on excellent sites in the Southern hemisphere. The United Kingdom is not at present a member. The European Science Foundation, which brings together the research councils and science academies of most European countries, has activities relevant to Near Earth Objects: in particular a programme called IMPACT on the consequences of the impacts of objects on the Earth. Also relevant is the European Space Science Committee, supported by the Foundation. Elsewhere Outside the United States and Europe there is some ground-based work on Near Earth Objects, in particular in Japan, China, Canada and Australia. In Japan the Japanese Spaceguard Association operates the Bisei Center with survey telescopes of 50 centimetres and of 1 metre (not yet completed) for observing both Near Earth Objects and also space debris which might threaten Japanese satellites. The only current activity in the southern hemisphere is in Australia where there are plans for a 0.6 metre telescope for operation early in 2001, with NASA funding and participation by the Catalina Sky Survey in Arizona. Regarding space, Japanese missions have observed the comet Halley; so too have spacecraft from the former Soviet Union, see Annex D.
1 METRE TELESCOPE OF LINEAR, New Mexico. The telescope, one of two on the site, is equipped with advanced CCD detectors and high speed computers. It operates automatically and sends data to the Lincoln Laboratory at MIT for checking and transmission to the Minor Planet Center. LINEAR has discovered more Near Earth Objects of diameter greater than 1 kilometre than any other system so far. Britain has long been among the world leaders in astronomy, and has expertise in the disciplines required in the study of Near Earth Objects and the consequences of impact. British industry also has the skills required to contribute through its expertise in solid state devices, information technology, and in telescope and spacecraft design and construction. Through the work of groups in about a dozen universities and other institutions, Britain has contributed to the international effort in the study of Near Earth Objects and the consequences of their impacts on the Earth. However, there is at present no continuing British involvement in coordinated programmes to search for Near Earth Objects and to determine their orbits. Current strengths in the British contributions include the theoretical prediction of the evolution of orbits under the influence of the gravitational field of planets and other asteroids, the determination of the size, mass, spin rate, and structure of asteroids from observations at optical and infrared wavelengths, and the use of the national meteorite collection as a data resource for the classification of asteroids. There is also very important British work on the impact record on Earth and the Moon, the modelling of crater formation by impact, and studies of the atmospheric effects caused by impacts. British researchers have a longstanding interest in developing an historical perspective on the impact record from both geological and human records. Most support for work on the subject comes from the Research Councils and the university system. None of the Councils has a specific remit for work on Near Earth Objects, but several are involved in different degrees and ways the Particle Physics and Astronomy Research Council (PPARC) for astronomy and space science; the Natural Environment Research Council (NERC) for the physical effects of impacts on the Earth (solid land, oceans and atmosphere); the Biotechnology and Biological Sciences Research Council (BBSRC) for effects on living organisms; and the Economic and Social Research Council (ESRC) for the economic and social consequences of an impact. PPARC is obviously the most directly concerned. It does not carry out astronomical work itself, but responds to initiatives from the academic community and funds work accordingly across the field of astronomy. There are several important centres of space research in Britain, with skills in instrument construction, mission planning and data analysis. Closely allied are centres of space engineering, both in industry, national institutes and universities, particularly in the field of small satellite technology, and in planetary landing devices. The Ministry of Defence and the Atomic Weapons Establishment have experience relevant to work on mitigation possibilities, but at present the Ministry of Defence has no specific remit regarding Near Earth Objects. THE 1.2 METRE UNITED KINGDOM SCHMIDT TELESCOPE at the Anglo-Australian Observatory, Siding Spring, Australia has conducted many all-sky surveys since the mid-1990s. The resulting plate archive at Edinburgh is proving very valuable in determining asteroid orbits. The telescope was used specifically for an asteroid survey between 1990 and 1992 in a programme led by Dr Duncan Steel. For the first time in the history of the Earth there are possibilities for mitigating the effects of impacts by Near Earth Objects and even, in the longer term, for deflecting them entirely from collision with the Earth. But all this depends on first improving our ability to detect such objects well in advance and to measure accurately their orbits and physical properties -our key science priorities -and on having in place mechanisms, international, national and local, to take the necessary action. Once an asteroid or comet on a collision course is identified and its orbit tracked, its likely point and time of impact can generally be predicted. Such accurate prediction is rarely possible for most other natural hazards, such as earthquakes. If the impact is on the sea, roughly twice as likely as on land, the resulting tsunamis could affect vast numbers of people living near coastlines. Wherever the impact, people could, in principle, be moved to safety, given sufficient warning and appropriate logistical support, although the degree of success would depend crucially not only on the size of the object but also on its composition, speed and angle of approach, and on the size of the population in the affected area. The great majority of impacts will be of smaller objects of less than a few hundred metres in diameter, for which moving people should significantly reduce loss of life. However, extensive material damage would nevertheless arise. After impact from a large object -fortunately very much less common than the smaller ones just mentioned -it would be difficult to sustain the population during the long period which might follow when the Sun's rays were blocked by dust injected into the atmosphere at the time of impact. The only realistic course would be to try to avert the predicted collision. A number of possible mechanisms have been considered for deflecting or breaking up potentially hazardous Near Earth Objects; most would require the use of a spacecraft with some means of transferring energy or momentum to the object, for example by kinetic energy transfer (by heavy projectiles carried on the spacecraft or by causing a collision between asteroids), by chemical or nuclear explosives, or even by mounting "sails" on the object to harness the Sun's radiation pressure. Some of these mechanisms are more realistic than others. Given warnings of decades or centuries, new technological developments would almost certainly emerge. The Task Force believes that studies should now be set in hand on an international basis to look into the practical possibilities of deflection. To try to destroy an asteroid or comet in space by a single explosive charge on or below its surface would risk breaking it uncontrollably into a number of large pieces which could still hit the Earth, doing even more damage. A more promising method would be to fly a spacecraft alongside the object, perhaps for months or years, nudging it in a controlled way from time to time with explosives or other means. This relatively gentle approach is particularly important because many asteroids and comets are held together only by their own very weak gravitational fields. The longer the time before impact, the more effective even a small nudge would be. This is not science fiction. When NASA launches its Deep Impact mission to comet Tempel 1 in 2004, the spacecraft will eventually release a half tonne lump of copper to cause a huge crater in the comet. Although this is not the objective, the result will also be to deflect the comet's orbit. However, the deflection in this case will be small in comparison to that required to deal with a real threat. Long period comets present new dimensions of difficulty. By definition, such comets have never been seen before. They come unpredictably at all angles from the outer reaches of the Solar System, but can usually only be seen when at a distance of about 5 AU from Earth. Warning of the approach of such a body could well be less than a year. Urgent measures and even more powerful rockets and explosives would then be essential. Any proposal to use nuclear explosives to deflect an asteroid or comet could well prove politically unacceptable in a world that seeks to reduce or abandon nuclear weapons, even though such explosives could probably be designed and controlled to prevent abuse. Indeed, the use of nuclear explosives might only be contemplated as a last resort if a major impact were otherwise inevitable. In considering the prospects for deflection, it would be necessary to take into account a range of international treaties and principles including the original Outer Space Treaty of 1967.The work of the United Nations Committee on the Peaceful Uses of Outer Space is also relevant as is the work of the Inter-Agency Debris Co-ordination Group, comprising representatives of space agencies of the United States, Russia, China, India, Japan, Ukraine and Europe. Some of this group's responsibilities are similar to those which would be required for any impacts by Near Earth Objects. NASA'S DEEP IMPACT MISSION, which will project a 500 kilogramme solid impactor into a comet, Temple 1 (artist's impression). A flyby spacecraft will take images and make measurements. The impactor will also take images of the comet's surface prior to impact. The mission aims to increase understanding of the composition and structure of comets. What is to to be done? If ever there was an issue affecting the whole world, it is the threat from Near Earth Objects. To understand and try to cope with the threat requires an international response. This response should cover not only understanding the science, so that dangerous Near Earth Objects may be predicted and methods of mitigation assessed; but, equally important, how all aspects of this response should be organised. The organisation must cover the identification and coordination of the science, communication with the public, and work on measures to react to a possible impact, or deflect or destroy an incoming object. At present no international institution exists for the purpose. Spaceguard is a collective term for a variety of activities which have grown up in a number of countries over recent years, and which have done much to alert public opinion. But none has official recognition except for the US Spaceguard Survey (the name given to NASA's survey), and so far there are no specific coordinating mechanisms in any state or government, even the United States. The need for an international approach was at the heart of our terms of reference and is central to our proposals for action developed in this chapter. Our terms of reference also asked us to confirm the nature of the hazard and potential levels of risk, which we have done in Chapters 2, 3 and 4; to identify the current British contribution to international efforts, covered in Chapter 7; and to suggest how these issues should be communicated to the public, which we cover in Recommendations 13 and 14 below and the preceding two paragraphs. Science needs The more we have studied the subject the more we can see how very little is currently known about Near Earth Objects, despite the efforts of United States and other scientists. We do not know accurately how many objects of diameter about 1 kilometre there are; and their energies and compositions are very uncertain. We know very little indeed about smaller objects. Without this knowledge we have only the roughest idea of the magnitude of the risk. The science involved is wide-ranging, involving astronomy but also geophysics, oceanography, climatology, biology and the social sciences. ° for academic studies: in particular of Near Earth Objects' interactions with the atmosphere, oceans, solid earth, climate and living things, including historical evidence; and the effects on people and society. What fair contribution should Britain make to fulfilling these needs? We have taken account of existing telescopes or those under construction in which the United Kingdom is a partner; the skills of British scientists and engineers, and industry; and our view that partnership in Europe in this task is desirable. NEO Taskforce Report Survey and discovery To make a substantial contribution to the need both for surveys in the southern hemisphere and for systematically discovering smaller Near Earth Objects, we propose the construction of an advanced new 3 metre-class telescope on an excellent site. We have considered the possibility of using older existing telescopes for the systematic survey and discovery of these objects, but have generally rejected the idea because adapting such equipment would be expensive and the resulting telescopes would not be competitive for long. Only a new dedicated telescope would make a satisfactory contribution to the world effort. Because such a facility would be expensive, we believe that this project should be shared with other countries, preferably in Europe. Much valuable data has been gathered cheaply from observations made for purposes unrelated to Near Earth Objects. An excellent example is the photographic archive, at the Royal Observatory Edinburgh, of the United Kingdom Schmidt Telescope in Australia. These records contain invaluable historical detections of Near Earth Objects which greatly enhance the use of current observations. The records are being converted to digital form and posted on the internet for use by astronomers worldwide, with funding from the Particle Physics and Astronomy Research Council. We hope that this will continue. Plates taken with United States Schmidt telescopes are also being digitised, widening this important database. Furthermore, we wish to encourage Near Earth Object discovery by efficient use of suitable current and future wide-angle survey telescopes dedicated to other aims. We recommend that arrangements be made for observational data obtained for other purposes by wide-field facilities, such as the new British VISTA telescope, to be searched for Near Earth Objects on a nightly basis. No current space telescope is dedicated to the discovery of Near Earth Objects. However, a number of existing and planned missions are, and will be, able to detect objects incidentally when making observations for quite different purposes. We strongly suggest that consideration be given by space agencies to consider the use of space missions for incidental observations of Near Earth Objects. Apart from existing telescopes (see Annex D), the European Space Agency's proposed GAIA mission and NASA's SIRTF project could each be used in this way without substantially modifying the mission or curtailing its main purpose. Accurate orbit determination A particularly urgent requirement is for observations to determine the orbits of Near Earth Objects discovered by United States telescopes but subsequently lost. This needs one or more professionally run telescopes. The l metre Johannes Kapteyn Telescope on La Palma in the Canary Islands, owned by the United Kingdom and international partners, could immediately fulfil this need, economically and without modification. This would not only fulfil an urgent need, but would also enable Britain to contribute immediately to the international programme of observations. Composition and gross properties The importance of determining the composition and gross physical characteristics of a Near Earth Object both to predict the way it would impact on the Earth and in planning mitigation possibilities including deflection, were emphasised in Chapters 2, 5 and 8. On the ground-based side, the scientific requirements could be fulfilled immediately by a number of existing telescopes to which the United Kingdom has access. For the southern hemisphere there is the 3.9 metre Anglo-Australian Telescope; in the north there are the 4.2 metre William Herschel and the 2.5 metre Isaac Newton Telescopes on La Palma in the Canary Islands, and in Hawaii the 3.8 metre United Kingdom Infra-Red Telescope. All are heavily over-subscribed; hence we believe that an arrangement should be made for small amounts of time to be provided under appropriate financial terms for spectroscopic follow-up. Several of the European Southern Observatory's telescopes in Chile would also be excellent for this work. We have considered the great value of radar observations for determining an object's gross structure and accurate orbit and noted that no such facility exists in the southern hemisphere. However, we do not propose any major British involvement in radar at this stage. Space rendezvous missions to asteroids or comets give a unique insight into the characteristics of the asteroid or comet being visited (Annex D). A systematic assessment of different types needs many missions, perhaps 20, to enable each type subsequently to be recognised by ground-based techniques, of great importance should countermeasures be needed. For this limited purpose it might be possible to use a series of essentially identical micro satellites, each launched economically piggy-back with other spacecraft; in this way the unit cost should be much below that of current rendezvous missions. We note that the United Kingdom is a leader in micro satellite technology. We suggest that a beginning could be made with a single demonstration mission. Coordination of astronomical observations The systematic archiving of the data and rapid dissemination of recommendations for follow-up by other observatories is essential. This role is carried out by the Minor Planet Center in Boston; the Spaceguard Central Node in Europe is designed to have a complementary role. We suggest that the United Kingdom and other governments, together with the International Astronomical Union, NASA and other interested parties, seek ways of putting the governance and funding of the Minor Planet Center on a robust international footing, including the Center's links to executive agencies should a potential threat be found. The role of the Spaceguard Central Node should also be considered. We recommend that the Government together with other governments, the International Astronomical Union and other interested parties seek ways of putting the governance and funding of the Minor Planet Center on a robust international footing. including the Center's links to executive agencies if a potential threat were found. NEO Taskforce Report Studies of impacts and environmental and social effects The prediction of the consequences of an impact requires, in addition to work by astronomers, interdisciplinary research by geophysicists, oceanographers, climatologists, social scientists and others. In the United Kingdom such activities are supported by the universities and by the Research Councils (including Natural Environment Research Council, and the Economic and Social Research Council). The European Science Foundation is currently supporting a limited programme in this area. Such research is not only of great practical importance, but also excellent science. The British Government should encourage high quality research in these areas. We recommend that the Government should help promote multi-disciplinary studies of the consequences of impacts from Near Earth Objects on he Earth in British and European institutions concerned, including the Research Councils, universities and the European Science Foundation. Mitigation possibilities The consequences of the impacts of most Near Earth Objects can probably be mitigated, or the objects themselves deflected, if we have determined their orbits in good time (Chapter 8). However, the arrangements needed are not simple and should be planned well before the prospect of any impact. The Government should consider participating soon with others in studies on mitigation possibilities, including of deflection methods for example through the European Space Agency or with the United States. Organisational needs The Task Force has considered what kind of structure would best meet the organisational requirement. There is an obvious need for some international forum for discussion of the scientific aspects of the problem. There is an equally obvious need for a forum for intergovernmental action. Without a strong connection between the two, not least to cope with rising public interest in the subject, proper coordination could not be achieved. There are no obvious precedents, although the emerging international arrangements to manage the problems of climate change come closest. A crucial difference is that while climate change is long term with accumulating effects, threats from Near Earth Objects could come tomorrow, in 50 years or in a thousand. Nonetheless the results of current research and greater understanding of the problem will maintain the current momentum of interest, which would of course accelerate in the event of a possible catastrophe. Any institutions, international or national, would then be put to immediate test. There is a hierarchy of possibilities which we now examine: first is the international structure; next European arrangements; then a British national structure; finally division of responsibilities within the national structure. No United Nations body or agency, can at present be held to represent the global interest in protection from Near Earth Objects. The UN Committee on the Peaceful Uses of Outer Space is too narrowly focused, and UNESCO with its brief on science in general is too wide. Although the Task Force is reluctant to suggest new institutions, something on the lines of the Intergovernmental Panel on Climate Change seems most nearly to meet the requirement. This Intergovernmental Panel has three main working groups: one on science; one on the impacts of change; and one on how change might be mitigated. The Panel, which brings together experts from all over the world, produces Assessments every few years, and has been an outstanding success. An Intergovernmental Panel on Threats from Space, financed by participating governments, would provide a light and unbureaucratic mechanism for coordination and consultation, issuing periodical Assessments as the situation required. Whether more formal arrangements were desirable, on the analogy of the Framework Convention on Climate Change with its successive meetings of the Parties, could be determined in the light of events. We recognise that interim measures may be needed before the integrated international structure we prefer could be fully established. In this, the International Astronomical Union, which is already doing much on the science side, should play an important role. Indeed, we expect that a final organisation based on the structure of the Inter-Governmental Panel on Climate Change would wish to continue to involve the International Astronomical Union. Regarding inter-governmental aspects, the Inter-Agency Debris Coordination group (covering the space agencies of United States, Russia, China, India, Japan, Ukraine and Europe) might be able to contribute; and for certain aspects, the UN Committee on the Peaceful Uses of Outer Space. At European level (see Chapter 6), the European Space Agency among other European institutions has already taken up the subject and could develop its interest further on behalf of its member states. The European Southern Observatory, of which most European countries are members, though not Britain, could play a major role in the study of Near Earth Objects with its facilities on excellent sites in the Southern hemisphere. The European Science Foundation, which brings together the research councils and science academies of most European countries, could help to provide and coordinate across Europe a broad base for research on all aspects of the impact problem, physical, biological and social. It already has a programme in the area and funds the European Space Science Committee with strong links to scientists in the United States. Because the threat covers all aspects of life, we believe that the European Union should also be fully engaged. We believe that the Government should discuss with other governments how Europe could best co-ordinate actions regarding Near Earth Objects, and how best to work closely with the United States, with complementary roles in specific areas, and with other interested countries. As a first step we suggest that the European Space Agency and the European Southern Observatory, with the European Union and the European Science Foundation, be asked to propose a strategy for this purpose. It could be discussed at the ministerial meeting of the European Space Agency in 2001. At national level no central coordinating body for Near Earth Objects has yet been formally identified within the government. In the event of any emergency, possible or real, virtually all parts of government would be involved, and the Cabinet itself would have to determine policy. This suggests that some Cabinet committee or ad hoc group, bringing in the Department of Trade and Industry, the Home Office, the Ministry of Defence, the Department for the Environment, Transport and the Regions, the Ministry of Agriculture, the Foreign and Commonwealth Office and other interested departments should be envisaged. The interim responsibility rests with the Minister for Science within the Department of Trade and Industry, covering the British National Space Centre and the Office of Science and Technology. The Task Force believes that a lead department should be formally designated, and lines of responsibility established against all eventualities. The lead department in Whitehall should act as the channel for recommendations to the Government, The Task Force would not expect this department to undertake all coordination and management itself. Instead the Task Force believes that a British Centre for Near Earth Objects should be set up whose mission would be to promote and co-ordinate work on the subject in Britain; to provide an advisory service to the Government, other relevant authorities, the public and the media; and to facilitate British involvement in international activities, whether through the means suggested above or through the International Astronomical Union and such other bodies as the Minor Planet Center in Boston. In doing so it would call on the Research Councils involved, in particular the Particle Physics and Astronomy Research Council and the Natural Environment Research Council, and on universities, observatories and other bodies concerned. The role of such a Centre would obviously evolve with experience. The closest analogy would be with the recently created Climate Change Centre to be established at the University of East Anglia. It should, like this, be unbureaucratic, and become the centre of a network in Britain but reaching elsewhere, with special responsibility for relations with the public. In this respect its objective would be to communicate in clear, direct and comprehensible language, avoiding excessive alarm or excessive complacency, with some very different audiences: on one hand Parliament, the general public and the media, and on the other the scientific, academic and environmental communities. The Task Force suggests that as a first step there should be a feasibility study to determine the terms of reference for such a Centre and how it might be financed. We recommend that one of the most important functions of a British Centre for Near Earth Objects be to provide, a public service which would give balanced information in clear, direct and comprehensible language as need might arise. Such a service must respond to very different audiences: on the one hand Parliament, the general public and the media; and on the other the academic, scientific and environmental communities. In all of this, full use should be made of the Internet. As a first step, the Task Force recommends that a feasibility study be established to determine the functions, terms of reference and funding for such a Centre. In suggesting arrangements of this kind international, European and national the Task Force has not attempted more than a sketch of the possibilities. The threat from Near Earth Objects may be a very old problem, going back to the origins of life, but recognition of the threat is new in human experience. Greater understanding of the problem is now coupled with the possibilities of mitigation. The creation of the structure proposed above would form a base for action, if it ever became necessary, and in the meantime give some measure of reassurance. There is no question more often asked of the Task Force: What is the point of worrying about the threat when we can do nothing about it? The answer is that we need to know far more about it than we do, and that with such knowledge something might indeed be done about it. 4.5 billion years ago the Earth was formed from material like that of asteroids and comets; and has been bombarded by Near Earth Objects (NEOs) ever since. Annex B gives specific examples of past impacts on the Earth and some recent near misses. This annex summarises the history of human understanding of asteroids and comets over the last three centuries. 1973 Arthur C Clarke coins term Spaceguard in his novel "Rendezvous with Rama"
1990 US Congress House committee in NASA Multiyear Authorisation Act of 1990: "imperative that detection Sept rate of Earth-orbit-crossing asteroids must be increased substantially, and that means to destroy or alter the orbits... should be defined and agreed internationally"
March 1993 European Science Foundation initiates new scientific network "Impact Cratering and Evolution of Planet Earth"
1997, Dec 9 Near Nuuk, Greenland ? The first five impacts above were reported in Lewis J S, Rain of Iron and Ice, Reading, Mass, Addison-Wesley, 1996.The remainder were reported from US Air Force Early Warning Satellites. Note that between August 1972 and March 2000, sensors in these satellites detected 518 impact events, all in the kilotonne of TNT class or above (objects above a few metres in diameter); this averages 30 events per year. Most of these events were primarily bursts in the upper atmosphere and were not detected at ground level. 1: Objects which were discovered as they approached the Earth to within 2 lunar distances. These are given chronologically by the date of closest approach. The lunar, or Earth to Moon, distance is about 400,000 kilometres. 2: Objects 200 metres and larger which were discovered after they had passed within two lunar distances some time in the last century. This conclusion was reached by calculating the past orbit of each newly discovered object. This Section analyses Near Earth Objects which have been observed over recent years to have come closer than two or four lunar distances of the Earth. The first two lists below cover close approaches in the past; the remaining two are predictions for the future. Although objects of all sizes are included, those under a few tens of metres in diameter would burn up in the upper atmosphere. The conclusion is that no known object presents a serious hazard over at least the coming 50 years. However, only about half the 1 kilometre objects have yet been discovered and a much smaller proportion of small ones. The Section is based on information kindly supplied by Brian Marsden and Gareth Williams of the Minor Planet Center, Boston (and some data from Andrea Milani's "riskpage" website, see Bibliography). 4: Objects for which the first orbital calculations indicated that they might impact Earth during the next 50 years. Further work has dismissed this possibility or made it improbable. There are nine objects of widely varying size. For three of them (marked * below) the possibility of impact was dismissed during the month or so after discovery as more observations were made and their orbits more accurately determined. For two of them (marked **, above and below) intervening close approaches (see list 3 above) did not allow current observations to eliminate the possibility of a later impact; fortunately, an impact was eliminated following the recognition of observations on old photographs (which existed because these objects are large and therefore bright). In the four remaining cases at least two would probably be too small to do damage. For the other two the available observations are yet to be performed to allow an impact to be dismissed. However, even before that, the chances of the object 1998 OX4 hitting the Earth is thought to be only about 1 in 2,000,000, and the much smaller object 1995 CS, 1 in 200,000.The objects are arranged in order of earliest possible impact date. 3: Objects 200 metres and larger that have been seen more than once and are predicted to pass within four lunar distances over the next hundred years. In addition there are several predicted possible approaches by objects seen only once, although none of them should come within two lunar distances. NEAT (Near Earth Asteroid survey 1.2 metre US Air Force telescope on Maui, Hawaii Tracking) controlled by JPL, follow up (commissioned early 2000) Pasadena sites: Maui, Hawaii and (USA) 1.2 metre Schmidt telescope at Mt Palomar, California (being Mt Palomar, California upgraded also to use the NEAT camera) huey. Goldstone Solar System Radar astrometry Planetary radar, 70 metre antenna controlled by JPL gross structure echo. DLR Planetary Radar follow up Planetary radar, 30 metre antenna. Uses radar controlled by the Institute of (Germany transmitters in Russia and USA Planetary Exploration (DLR), with USA/ pentium. Bisei Spaceguard Centre survey 0.5 metre telescope currently in use (for NEO search and controlled by Japanese Spaceguard follow up for tracking space debris) Association with National Space (Japan) 1 metre telescope near completion Development Agency, the neo. OCA-DLR Asteroid Survey survey Pending controlled by (France/ 0.9 metre Schmidt telescope (Since April 1999 this Observatoire de la Côte d'Azur Germany) observing programme has been discontinued) (OCA), France and the Institute earn. ICE previously called International Sun comet Giacobini-Zinner: pass through tail, International Cometary Earth Explorer, ISEE-3. 1985 Explorer NASA 1. science of Sun; comet Halley: distant flyby, March 1986 launched 1978 2. to pass through tail of a comet and stardust. DEEP SPACE 1 1. demonstrate new technologies; asteroid Braille: flyby, July 28 1999 NASA 2. determine physical properties and Comet 19 Borelly; September 20 2001 launched 1998 measure elemental, mineralogical nmp. STARDUST 1. fly probe to within 100 kilometre comet Wild-2: encounter, 2004; NASA of comet Wild-2's nucleus; June 2004; Sample return, 2006 launched Feb 1999 2. interstellar dust collection en route stardust. SIRTF 1. infra-red space telescope Space based Infrared (aperture 0.85 metres) sirtf. SWIFT 1. study gamma-ray bursts; asteroids will be detected as 'noise' to NASA burst -alert telescope; X-ray telescope; the primary data for launch 2003 ultraviolet/ optical telescope swift. ESA (1-metre class telescopes); planned for launch in or 2. predicted also to discover NEOs down after 2009 to about 500 metres. albedo: a measure of an object's reflecting power; the ratio of the amount of light scattered by a body to the incident light. amor: an asteroid with an orbit always exterior to the Earth's, but interior to that of Mars. aphelion: the point at which an object in orbit around the Sun is furthest from it. apollo: an asteroid with an orbit that lies mostly but not entirely outside that of the Earth; its orbit may cross that of Earth. asteroid: a minor planet; a body of rock, carbon, or metal orbiting the Sun. Most asteroids occupy the Main Belt between the orbits of Mars and Jupiter. The largest asteroid is Ceres, diameter 950 kilometres, and the size of asteroids ranges down to countless numbers of boulders. astronomical unit, or AU: the average distance between the Earth and the Sun; about 150 million kilometres. aten: an asteroid with an orbit that is mostly interior to that of the Earth; its orbit may cross that of Earth. comet: a body of dust and ice in orbit about the Sun. As it approaches the Sun it may develop a "fuzzy" head and a tail from the gas and dust ejected from the nucleus. CCD: a "charge-coupled device"; an electronic detector sensitive to visible or infrared light, giving a signal that can generate a digital image as in a TV camera. CCDs require powerful computers to analyse and display the data. Earth crossing asteroid [or comet]: an asteroid [or comet] whose orbit crosses that of the Earth if viewed from the pole of the Earth's orbit; the asteroid [or comet] may pass above or below the Earth's orbit. Edgeworth-Kuiper Belt: a region beyond the orbit of Neptune extending to around 1,000 AU from the Sun and containing perhaps a billion objects; the source of short-period comets. electromagnetic spectrum: the range of all wavelengths emitted or absorbed by matter, including not only visible light, but infrared and radio at longer wavelengths and ultraviolet, X-rays and gamma rays at shorter wavelengths; analysis of the spectrum is the main way that astronomers gain insight into the nature of astronomical bodies. giant planets: the four outer planets in the solar system: Jupiter, Saturn, Uranus and Neptune. These planets are very massive, of great size, yet of low density compared to the inner or terrestrial planets Mercury, Venus, Earth and Mars. The giant planets have no solid surface, being composed mainly of hydrogen, while the terrestrial planets have rocky surfaces. infrared radiation: light at wavelengths beyond the red part of the spectrum, to which our eyes do not respond. Much infrared radiation falling on the Earth is stopped in the atmosphere, so infrared telescopes must be in orbit or on the tops of high mountains. K/ T boundary: the Cretaceous-Tertiary boundary, that is the boundary between groups of geological strata, signifying a global climatic change some 65 million years ago. The K/ T event is whatever caused this global change, and is identified with the asteroid impact that caused the Chicxulub crater. light year: the distance travelled by light in free space in one year; about 100 billion kilometres, or about 60 thousand AU. The nearest star to the Sun is about four light years distant. long-period comet: a comet with an orbital period longer than 200 years; such comets are thought to originate in the Oort Cloud, and can approach the Sun from any direction. lunar distance: the average distance from Earth to Moon: 384,400 kilometres, 0.00256955 Astronomical Units (AU) or about 1.3 light seconds. magnitude: a measure of the brightness of astronomical objects; the smaller the number the brighter the object. A difference of 5 magnitudes corresponds to a change in brightness of 100 times. meteor: the bright streak of light - a "falling star"- that occurs when a solid particle from space (a meteoroid) enters the atmosphere and is heated by friction. meteorite: a solid body that partly survives the passage through the Earth's atmosphere, and reaches the Earth's surface. near Earth asteroid: an asteroid whose distance from the Sun at perihelion is less than 1.3 AU. near Earth comet: a comet whose distance from the Sun at perihelion is less than 1.3 AU. Near Earth Object (NEO): a near Earth asteroid or a near Earth comet. Oort Cloud: a sphere around the Sun, extending to about two light years in radius, filled with a huge number (more than a thousand billion) of cometary nuclei that are the remnants of the formation of the solar system. Passing stars are thought to perturb objects from the Cloud, and cause the long-period comets. perihelion: the point at which an object in orbit around the Sun is closest to it. potentially hazardous asteroid: an asteroid of at least 150 metres diameter, with an orbit that is within 0.05 AU of the Earth's orbit. radar: active sensing of an object using a beam of radio waves directed at the object; the detection of the reflected radiation from an asteroid or planet can give information about position, velocity, rotation, and morphology. short-period comet: a previously detected comet, with period less than 200 years; such comets tend to approach in the plane that contains the planets, are thought to originate in the Kuiper Belt, and their orbits are subject to perturbation by the planets. spectroscopy: the analysis of radiation, and inference of its source, by splitting the radiation up into its constituent wavelengths. tsunami: a deep water wave generated in the ocean at the site of an earthquake, underwater landslip, or asteroid impact; a tsunami amplifies and breaks when it runs into shallows; incorrectly known as a tidal wave. visible light: that part of the electromagnetic spectrum to which our eyes respond. In the chapters of this report references are only given for each Table and Graph. For the craters in Annex B-1, references are given at the end of this Bibliography. Annexes C and D themselves include names of relevant websites. Otherwise, reference should be made to the books, papers and web sites listed below. Gehrels T (Ed), Hazards due to Comets and Asteroids, University of Arizona Press, 1994, ISBN 0-8165-1505-0 This covers all aspects of NEOs, comprehensively. ESOC study (2000); Spaceguard Integrated System for Potentially Hazardous Object Survey, Carusi et al, ESOC Contract No. 13265/ 98 with report ref D/ IM, SGF/ Pr# 2/ Doc-05, 28 April 2000. Grintzer C, (1998) The NEO Impact Hazard and options for mitigation, EUROSPACE Technische Entwicklung GmbH, Potsdam, Germany. Harris, Alan W (1998b), Searching for NEAs from Earth or Space, Highlights of Astronomy, 11A, 257 (Ed: J Andersen for IAU). References to major impacts listed in Annex B-1 [1, 4, 7, 12] Impact Craters on Earth, NASA pages observe. Moon impact craters and Earth. Image courtesy of NASA.